Benedict XVI. The last of Benedictins, the first of Thomists Crucifix, was it defended properly? It is not just a book about the life of Jesus. It is a book that put the life of Jesus in the midst of everyone’s everyday life. It is a book that tells something about the life of Benedict XVI. Through Jesus life, we can understand the life of a Pope. The second book of Jesus of Nazareth has been published the last 11th of March. After the first book (published in 2007), Benedict XVI took about three years to write the second part of the life of Jesus. 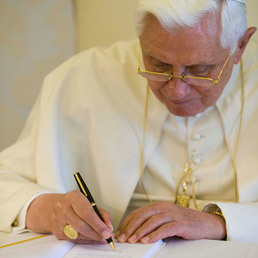 The third part – about the Gospels of the Infancy – will be probably published in March 2012. These books belong to the theologian Joseph Ratzinger. They are not linked to the teaching of the Church. It is a truely modern decision. The Pope renounces to his infallibility, uses his secular name, exposes his writings to the critics.. Theology is the human (and continuously perfectible) try to tell God. Joseph Ratzinger knows it. He also feels a mission: to save theology from its own divert. The divert of putting in discussion the roots of the Faith. It is what happened with life of Jesus. Since 18th Century, “life of Jesus” was a highly appreciated and spread literary genre. But he ran into a big error, according to Ratzinger thougth. The error was to detach the biographic story of Jesus from theology. It’s the victory of historical-critic method, which gave a fundamental contribution in Scriptures contextualization, and at the same time removed the Scriptures from their original dimension. Attention is focused on the audience the Gospels are referred to. But Gospels are also made up of «pure» theology. They talk about a life, an example, a prophecy. Gospels represent the roots of being Christian. This is the heart of Joseph Ratzinger thought. Ratzinger planned to write a book on life of Jesus since the Fifties, when he was a theologian at the Second Vatican Council. He became sure he needed to do it during the Sixties, when he realized that historic-critic method – yet being the basis of his academic career – did not respond to the question on God, and it instead unbind Christ historical character from the «theological» Christ. He finally decided to write the life of Jesus during the Seventies, when he became aware of the necessity to promote the continuity of the Church (and that was why he was one of the founders of the review «Communio»). Reflections on life of Jesus would help us to understand the Pontificate. Last March, in the midst of pedophilia scandal, Benedict XVI writes a letter to Irish Catholics. He beg forgiveness for priest abuses, hold out his hand, put the Irish Church in charge to clean itself inside and helping it with four commissars. But he points his finger on a wrong interpretation of the Council that brought to believe that there is no evil and there are no rules to establish. It would be just like having a wonderful car and at the same time complaining of the brakes. It is what Ratzinger writes in his book on life of Jesus. Ratzinger writes that liberal exegesis stated that Jesus would have «substituted the ritual conception of purity with the moral conception. In replacement of the worship and its world morality would take over. So Christianity would essentially be a morality, a sort of ethic rearmament». This is not the novelty of New Testament, indeed. Benedetict XVI makes the next step: put the Church in penitence and purification, and he entrustes the Church to the Virgin Mary, during his trip in Fatima. He asks once again forgiveness for the sins of the Church, he consecrates priests to the Immaculate Heart of Mary, he says words that remember the ones he wrote for the meditations of the last via Crucis of John Paul II. «How many times – Ratzinger prayed – His Word is diverted and abused! How little faith is in many theories, how many empty words! How much dirtyness is in the Church, eveng among the ones, as priests, should completely belong to Him! How much haughtiness, how much self sufficiency! How little we respect the sacrament of reconciliation!» There is the need to get back to the purity of Jesus, and then watch out for not becoming «dirty» (as sinners) again. «Our vigilance is justice», Ratzinger writes in the book. Justice must never be separated from the truth. «Cooperatores veritatis» is the Episcopal motto chose from the Bishop Joseph Ratzinger and then Pope Benedict XVI. Truth divides, brings dissensions and difficulties. After revoking the excommunication to four lefevbrist bishops, Benedict XVI is attacked from the flak of the same bishops of Catholic Church. So he decides to write a letter to bishops, in the one he explains why some lack of thought happened, but he complains of his brothers ready «to bite and devour». Was writing that letter the right thing to do, since it brought even more critics? Benedict XVI could have preferred peace, like Pontius Pilatus did. Ratzinger talks about the Roman governor in a chapter of the book. Pontius Pilatus knew that Jesus was not a revolutionary. He knew the truth. But finally he is inclined to the “pragmatic interpretation of the law: more important of the truth is the pacifying strongness of the right, and this was maybe his thougt, or this was how he justified his decision. To Pontius Pilatus the peace was – in that case – more important than justice”. But, the Pope concludes, “peace cannot be established against the truth”. It is the dilemma the Pope has to face everyday. Should he keep peace among the Church, with a series of balancing act between conservators and progressists, or acting looking for the truth, risking to create division? The Papal dilemma is the Pilatus one. Every Pope needs to decide wheter to be Jesus or Pontius Pilatus. It is a very hard decision.